On Top of the World: What the heck is Swagbucks, anyway? Some of you have probably noticed the Swagbucks banner in my sidebar. Some of you know what it is, but undoubtedly there are a few of you who have no idea and who hesitate to click on it because goodness knows where it could lead you. Winning stuff by searching online? Scams start off with a hook like that all the time, after all. This one? Not a scam. What it is is a search engine that rewards you with a certain percentage of their ad revenue when you search. Use their site to find what you're looking for, get a little reward every so often, and keep coming back to get more rewards. It's a benefit for everybody. You exchange the points for prizes once you've saved up enough, and the prizes are pretty good. Magazine subscriptions, gift cards to websites and restaurants, TV shows and songs to download through iTunes. There's a good variety of things, and you get to earn them by doing nothing more than you'd be doing when you search for something online anyway. It's not a bad search engine, either. Not as good as Google, I have to admit, seeing as how quite often you actually have to ignore the first few links that it brings up because they're nearly always sites that will try to sell you something, but if you know how to read it, it's a pretty decent system. They also have things like Megabucks fridays, where when you search for something on Fridays, you have chances of winning increased Swagbucks. It's not unheard of for a person to win 100 Swagbucks at a time. 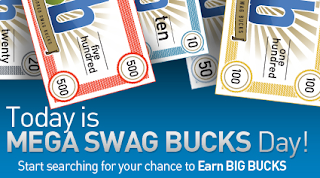 What does 100 Swagbucks mean, though? Well, it can mean $5 directly into your PayPal account, for one thing, with some points left over. It's also got a nifty referral bonus, too, where for everybody that signs up under your referral, Swagbucks matches the points that they earn, up to 100 points. So when somebody who signed up under my referral earns 5 Swagbucks, for example, so do I. And so does anybody that signs up under your referral. I've tried out a few "search and win" sites before, and some of them have been scams, or give tiny points values, or some other thing that makes it not worth it to stick around. But Swagbucks is actually one of the best I've seen, which is why I use it as often as I can. My trick is to search for things I already know. Need to look something up on Wikipedia? Just use Swagbucks to search for Wikipedia instead of typing in the URL yourself. You'll get there with just one extra click, and you've got the chance to win some points in the process. Sneaky, but effective. Sign up and give it a whirl. It may take a while before you get enough to exchange for something, but the fact that you can get it for free is a big bonus, in my book, and there are some pretty cool prizes to choose from in their catalogue.